Ah, Shenandoah. 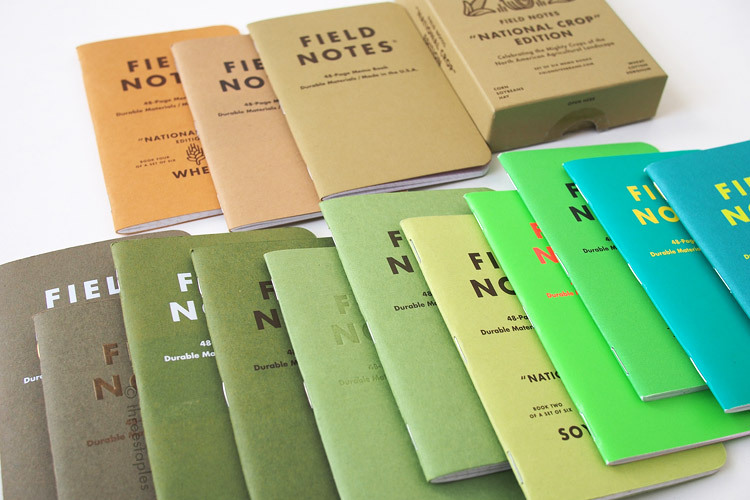 As soon as I saw the official images for this 2015 Fall edition of Field Notes Colors, I knew I would love it. I thought, now there’s a classic-looking Field Notes edition that I’ve been waiting for. And I was not disappointed when I finally saw it in person. I couldn’t wait to use it right away. Before Shenandoah was announced in mid-September, subscribers were teased with an image of hazy ridgelines in the distance, and it turned out to be part of the scenery at Shenandoah National Park. As the name suggests, the Shenandoah edition takes inspiration from this park, particularly its trees and their fall foliage. When you open the green covers, you’ll find different colors on the inside covers; they represent the leaves when they turn colors in the fall. I love that we finally get a Colors edition with an obvious seasonal theme. It’s been a while: I would argue, as someone who's used to four seasons, that the last truly seasonal edition was Cold Horizon from Winter 2013. I love almost everything about Shenandoah (see how it ranks in my Field Notes ranking). I love the inspiration behind it, the simple execution of the theme, and, my favorite: matte French Paper covers. The weather doesn’t yet feel like fall where I am, but I could probably wax poetic about this edition until cows come home. I will try not to though! Small illustrations of leaves on the back covers. They are a departure from the more graphic style previously found in editions like National Crop, Drink Local, Arts & Sciences, and Workshop Companion. I like this change. To me, Shenandoah is a new classic with a twist. It’s very reminiscent of the old Colors editions, with its minimal design and familiar colors. Even Field Notes compare it to Mackinaw Autumn and Just Below Zero, which are some of the earliest Colors editions, both with pretty strong seasonal flavors. But Shenandoah has enough variations and details to keep it from being boring. The covers are made with French Paper stocks in colors we’ve seen before, but they are reinterpreted in a new context. The custom-duplexing in contrasting colors achieves the seasonal theme, and adds an element of surprise when you open the memo books. Also note that the body paper is thicker than the usual 50#T. On the back cover of each book, there’s a small, elegant illustration of a leaf and a description of the tree, all in a simple layout with plenty of space to breathe. Other autumn-like details that make Shenandoah special and interesting: text printed in brown ink, slightly green graph grid, and the birch veneer belly band. 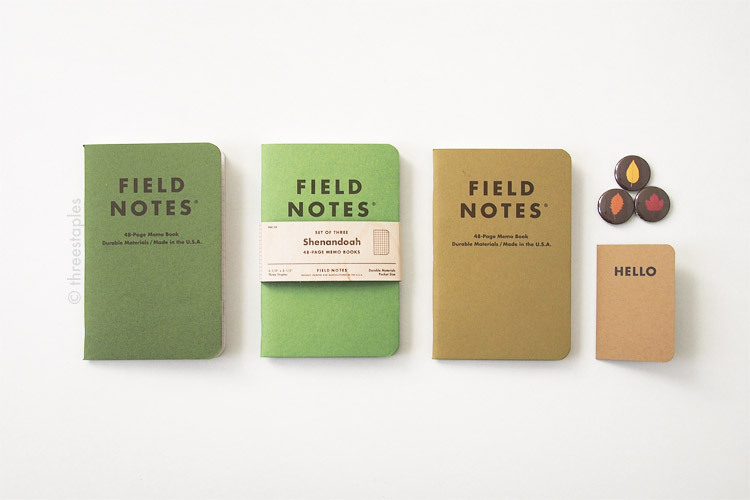 I’m glad Field Notes didn’t go overboard with the concept and kept it understated. I very much prefer the quiet simplicity of the old Colors editions and the nostalgia they bring, so Shenandoah has been a welcome change for me, especially from the last Colors edition (Workshop Companion). It’s been in constant use ever since I got it in the mail, and I plan on using it in other seasons, too. The key characteristic of Shenandoah, the duplex covers, is not new in Colors. We first saw them in Raven’s Wing (Fall 2010) and then in American Tradesman (Summer 2011); both editions use pre-made duplex papers from Neenah. 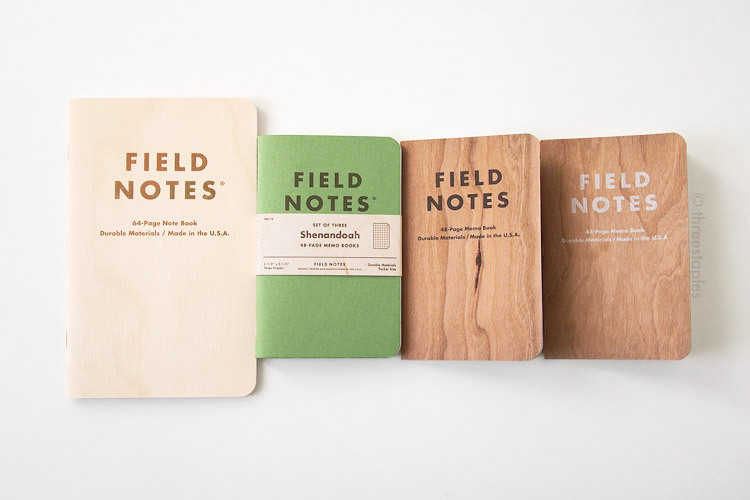 Shenandoah is different in that it is the first time Field Notes used custom-duplexed covers, made with stocks from French Paper to match the colors they had in mind for the Shenandoah trees. (Duplexing is when you take two different colored papers and fuse them together to make one sheet). I’ve been wanting Field Notes to use Neenah duplex papers again but I did not expect them to make their own. French or Neenah, I’ll take what I can. Like Field Notes said, they could have just taken a white cover stock and printed a different ink on each side but I find that end result not as rich as fusing two already-colored papers together. My Shenandoah covers are starting to crease beautifully, without any white showing through; this is why like it when Field Notes uses French papers (or Neenah papers). The next noteworthy “first” in Shenandoah is its body paper in 60#T. It’s still the often-used Finch Paper Opaque Smooth in “Bright White”, but it’s slightly thicker than the usual 50#T. Not as thick as the innards we’ve seen previously in Traveling Salesman or Shelterwood. Those are 70#T. I did a quick test of the paper with my fountain pens and found the 60#T to be not any significantly better than the 50#T. Very similar, in fact. Perhaps fountain pen users with a wider range of nibs and inks would have a different opinion. But I use gel pens and pencils with my Field Notes, so these sturdier innards work well for me and are a nice bonus. Only time will tell if this 60#T will be an exception or a standard, but I do hope to see it again. It adds a nice heft to the memo book without making it too bulky. Another “first” worth mentioning: it’s the first time we see birch veneer used in Colors, in the form of Shenandoah’s belly band. Shelterwood (Spring 2014), and its non-Colors cousin, Cherry Graph, are made with Cherry wood and are darker in color. We do see birch in the first Starbucks Reserve Roastery Edition from 2014, but that is not part of the Colors series. Lastly, inside the Shenandoah edition was a small “HELLO” note tucked between the books. The note is in the shape of a Field Notes memo book and it opens up to a message from FN, urging you to get on their mailing list, and a sincere pronoucement of thanks, numbered FN-25. How cute! This seems like one of FN’s new promotional items, and Shenandoah is the first in Colors to be packaged with it. More details in Bold Futura, I love it. Some writing utensils I like to pair with Shenandoah: Pilot Juice gel pen in Coffee Brown, Tombow 8900 pencil, and Tombow LG-KEA pencil with recycled wood. 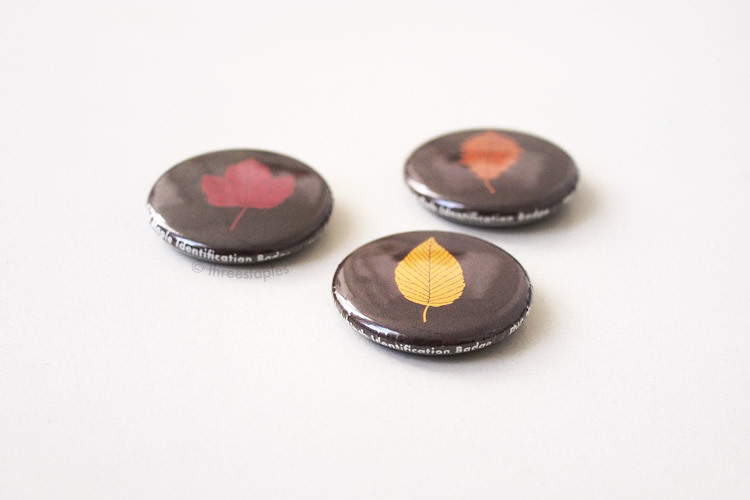 One-inch buttons for subscribers: Leaf Identification Badges. Backrim texts include item numbers. Can’t tell from this picture but some of my buttons were assembled crookedly, making the white texts appear on the front of the button. Still, they are very cute and look almost... edible. Like chocolates. Mmm. Shenandoah is the 2015 Fall edition of COLORS, the 28th in the series. Edition size: 40,000 packs printed in September 2015. FN offered 1,000 new subscriptions starting with this edition. What are your thoughts on Shenandoah? Have you been to Shenandoah National Park? Did you recognize the old colors from Grass Stain Green and Day Game? National Crop and Fire Spotter? I wonder if Shenandoah is Field Notes’ way of giving newer fans a taste of their old editions, without reprinting them. I know using “Sweet Birch” is as close to using Grass Stain Green as I’ll ever get. Or maybe they just really like working with French Paper and will continue reusing their colors in different ways. Whatever the case, I think they managed to create a beautiful classic without repeating themselves. I would like to end with a link to my fellow Field Notes fan, Mike Bates, and his excellent review of Shenandoah. Read his take on it while sipping a cup of coffee or tea, and enjoy all the autumn vibe in his beautiful photography! 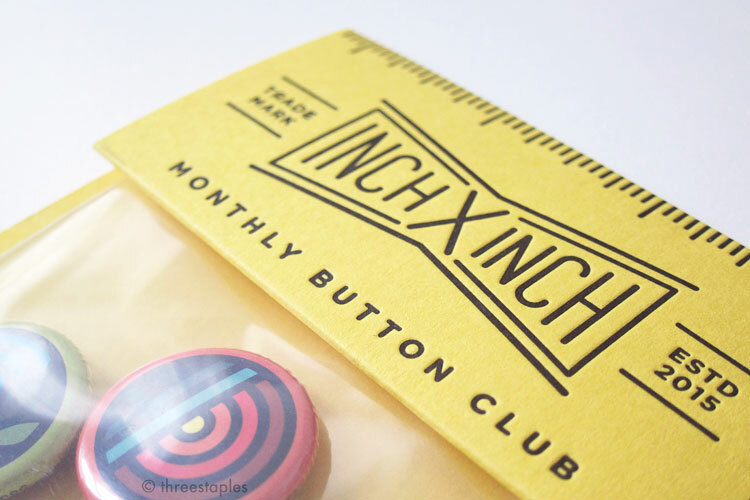 INCH x INCH is a monthly button club that was launched in early 2015 to help youth art education. It was created by Bob Ewing and Drew Hill, both from the Indianapolis-area with art and design backgrounds, and they donate the proceeds of the membership to two charities that support national and local youth art education. At the moment, those charities are Art With a Heart and 826CHI. Each month, club members receive 3 one-inch buttons that are designed by a collaborating artist. 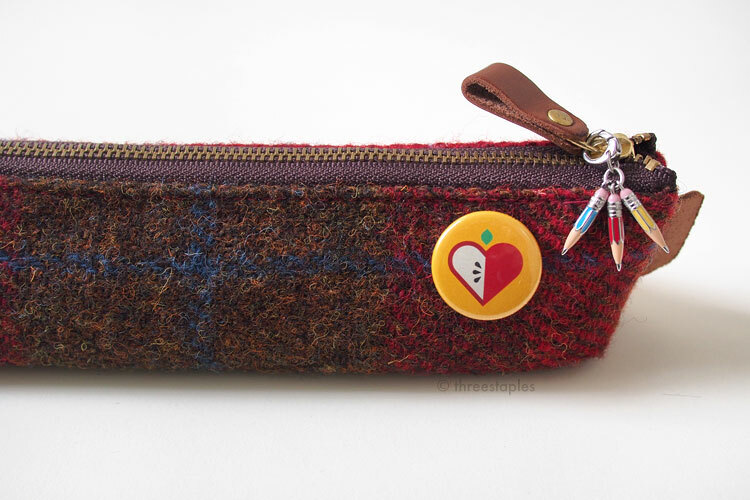 The membership is for a whole year, so you get a total of 36 buttons for $30 ($40 if you’re outside of the US) along with some bonus branded buttons during your first month. Bonus buttons with your first set of buttons. They are not laminated, and you can feel the letter-pressed goodness. Better not get them wet though! I’m not a pin-back button enthusiast or a collector by any means, but I’ve come to enjoy them quite a bit. (Field Notes buttons may have had something to do with that.) 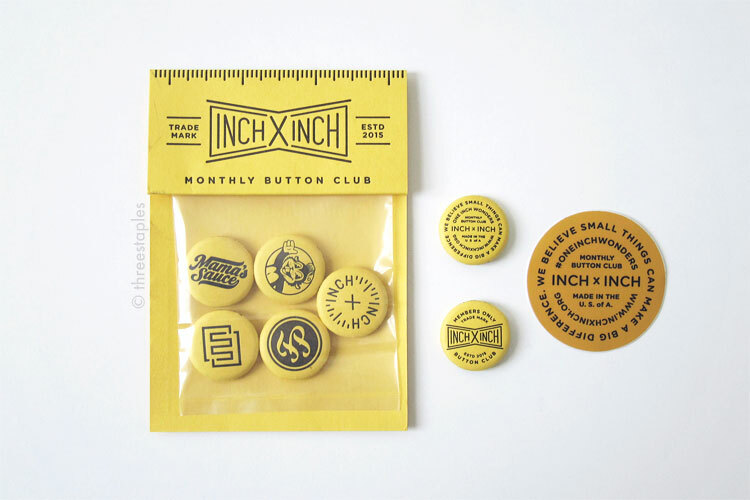 In person, the INCH x INCH buttons are really as cute and as fun as they look online. The Aaron Draplin buttons from May have a horizon theme with his signature thick lines, and I’m especially enjoying the Allan Peters buttons from June with the pencil and notebook design. 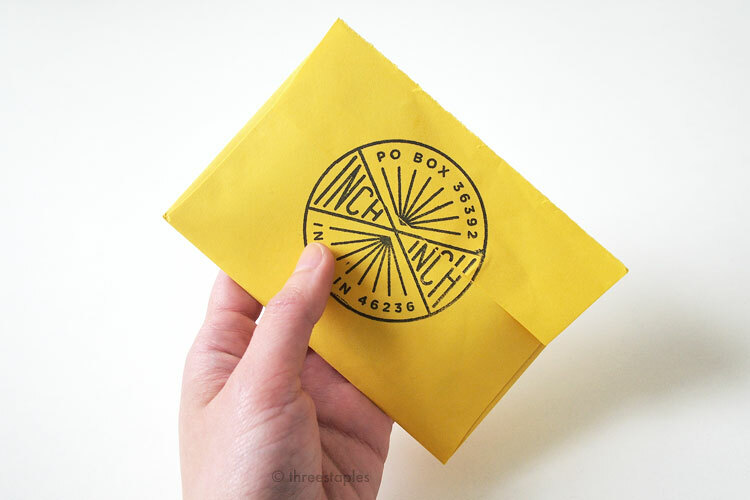 And the classroom-themed branding and packaging of INCH x INCH, with the sunny yellow color and letterpressed cards, are a joy to experience. It feels like you’re receiving a little gift in the mail from a friend. Each button has backrim text! I’m glad I finally subscribed. I’m contributing to a good cause, however little, and I get cool surprise every month in return! I may be having too much fun actually… I’m wondering where else I can accessorize with my next set of buttons. Button use case #003: backpack. #001 is here. Do check out their website http://inchxinch.org for more details if you’re interested. Their site is well designed and friendly to browse with plenty of subtle details and wit. (The membership form redirects you to Paypal, btw). I really think the folks over at INCH x INCH are on to something, and I’m looking forward to seeing how their project grows.